Here is a holiday gift idea that is sure to be enjoyed by the entire family……a beanbag from Bean Bag Boss! 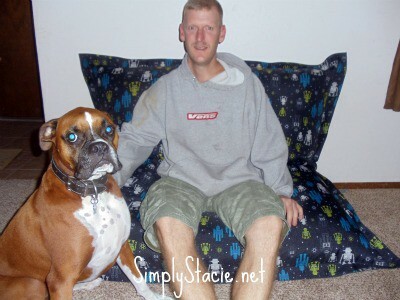 This online retailer specializes in beanbag chairs and there is a wonderful selection of colors and patterns available to choose from so that you are sure to give the perfect gift. Our beanbag from Bean Bag Boss is so versatile. We have used it as a comfortable chair for playing video games, lounging and reading books and curling up on it together during family movie night. It even worked as a bed for my six year old when his grandfather was visiting recently. I am very impressed with the quality of the bean bag because it is durable and the robot themed pattern is a bit hit with my children. It is the perfect accessory in their playroom. This makes it such a versatile chair that can be used by the entire family. When the kids are in bed, my husband and I love to sneak out the beanbag and lay back against it while watching our favorite shows. I really appreciate that our beanbag is made of 100% durable polyester so it is very easy to keep it clean and it has held up well with lots of active play from our children. The filling feels nice and seems like it contours to the body making it an extra comfortable chair. Bean Bag Boss makes shopping for a beanbag online very easy. Simply choose from a vast selection including a whopping 117 different colors, prints, patterns and fabrics. The beanbags range in price from $169.99 to $199.99 which is a very good value in my opinion for a high quality, durable chair that can be used in so many different ways. Even better….shipping is FREE! You are invited to visit the Bean Bag Boss website to browse the entire selection…..which chair is your favorite? **Exclusive offer for Simply Stacie readers! Use the promo code “Simplystacie-999” to receive $10 off each purchase (unlimited use) through 12/31/11! I love bean bag chairs! The multi spin art and the black star doodle are my favorite.